Parc Jean-Drapeau is a casino, a beach, an English garden, and a dog sledding destination. It's a tech house rave, a roller coaster, and a haven to flower-blooming trees and waterside willows. It's a destination unlike any other in Montreal, a 286-hectare oasis with enough attractions to keep visitors delighted for days. 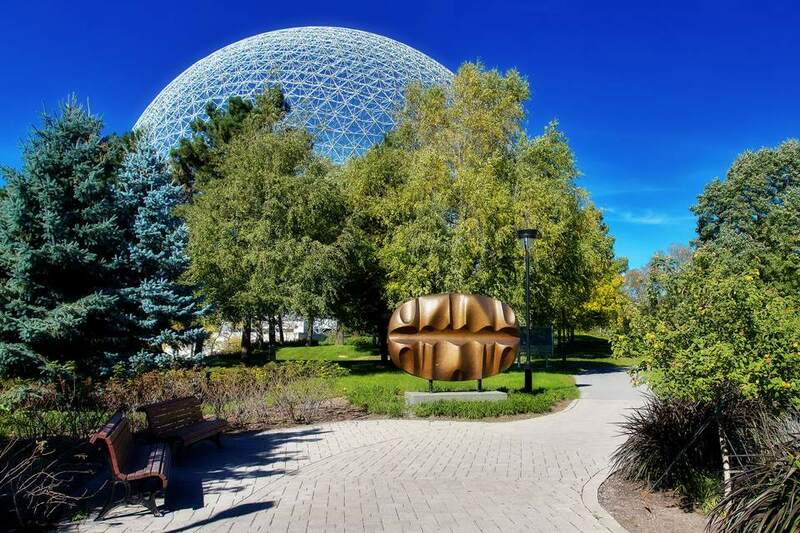 That huge geodesic dome/Montreal tourism postcard superstar is the Montreal Biosphere, a USA World's Fair pavilion turned environmental museum with entertaining, interactive hands-on exhibits particularly useful in explaining environmental issues to kids. Explored topics include climate change, sustainable development, and responsible consumption. The site of the Formula 1 Canada Grand Prix and Nascar races, the Circuit Gilles-Villeneuve slows itself down for the rest of the year, opening the track to cyclists, joggers, ​cross-country skiers, rollerbladers as well as everyday strollers and drivers, including high-performance vehicle owners aching to try out the track, provided they're willing to stay within the 30 km/hr limit. As one of the city’s most important winter draws, activity options are anything but in short supply, with opportunities to play, eat, and drink... on ice! It's loud, it's flashy, it's the Casino de Montréal! Don't expect Vegas but do anticipate a cross between laid back and upscale spread out on several floors. And according to insiders, the Casino de Montréal has high betting limits, possibly the highest in Canada. Open 24/7. Eastern Canada's largest amusement park, La Ronde offers around 40 different rides, from high-adrenaline thrill rides to family-friendly teacups. Roller coaster features include the Cobra's 360° vertical loops, Le Vampire's suspended coasters, and The Monster's altitude appeal: it's the highest double wooden roller coaster in the world. Plage du Parc-Drapeau is what it is, a ​man-made pond, and a large one at that. It does the trick on a typically hot and muggy Montreal summer's day, no doubt, but if you're more accustomed to the black sands of Maui, be forewarned: Plage du Parc-Drapeau's waves might reach your ankle. If you're lucky. This weekly outdoor electronic event featuring top local and international DJs, from May through October, attracts a bigger crowd every year. From clubbers to families, it's one of the most unique daytime raves in the world and it's an absolute must-attend. California has Coachella, Glastonbury has, well, Glastonbury and Montreal? Montreal has Osheaga, a smaller-scale answer to its mega-fest cousins, a music festival held in Parc Jean-Drapeau every summer, one featuring dozens of the hottest acts in the music industry, from headlining household names to up-and-comers poised to take their place. Think Osheaga is the only major festival on Jean-Drapeau park soil? Come summer is also IleSoniq and Heavy MTL, two notable music fest draws, in addition to family-friendly Les Weekends du Monde. And in the winter, it's all about snow at La Fête des Neiges. The Floralies Gardens are remnants of an international horticultural fair from back in 1980, a superb assortment of English style gardens, weeping willows, and trees with flower blooms. History buffs have 500 years in the form of nearly 27,000 artifacts to discover at the Stewart Museum, from weaponry to artwork to rare books covering the museum's previous life as a British military complex.